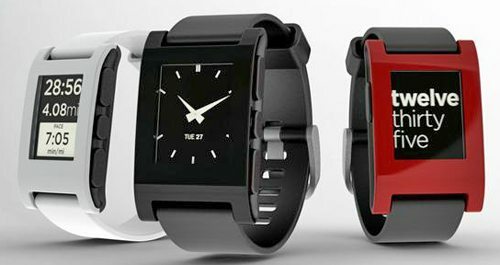 This Pebble E-Paper Watch is a Kickstarter project. It probably set a funding record, receiving pledges of over a million dollars in 28 hours. The Pebble watch connects to an iPhone or Android smartphone via Bluetooth, so you’ll be notified of incoming calls or emails with a vibrating alert. You can access functions of the phone on your watch – for example, bikers or runners can use the GPS functions of the phone to display speed, distance and pace data. You’ll be able to control music playback from your watch. The developers are also working with Freecaddie to “create a great golf rangefinder app for Pebble that works on over 25,000 courses world-wide. Instead of using your phone, view your current distance to the green right on your wrist. There’s an SDK available, so other developers can make apps for the watch.” The watch has a 144 x 168 pixel E-Paper display, so it will be visible in direct sun. There’s a lot more to learn about the Pebble Watch on the Kickstarter page. Even though there are still 35 days (at the time of writing) left in the funding period, they’ve far exceeded their funding goal. You still have time to make a $115 pledge (minimum) to receive a Pebble of your own. I went and backed this project right away. JUST what I’ve been looking for! Thank you Julie!!!! This is the direction we hope Apple would go with the nano. Letting developers create apps which would show on the nano would be a great way to integrate the iPod/iPhone line. While the Pebble is an awesome idea, Apple can pull the rug from under it pretty easily. Still, we would definitely buy a watch once it is on the market. Backed the project as well. I hope it is as good as it looks!